Bali’s exotic appeal owes much to its unique and vibrant culture as well as its natural beauty, from sweeping mountain panoramas with stretches of rice paddies to exotic sea temples bordered by rolling surf, making it a perfect spot for a cheap Bali wedding. With such gorgeous backdrops, why not make it the setting for your most cherished day? Getting married in Bali is a top consideration for many who have found the love of their lives and are looking for both an exotic and romantic setting to exchange vows. It is no secret that hotels and resorts in Bali make very good use of their locations, be it beachfront or the central highlands, with the most memorable setups on offer. 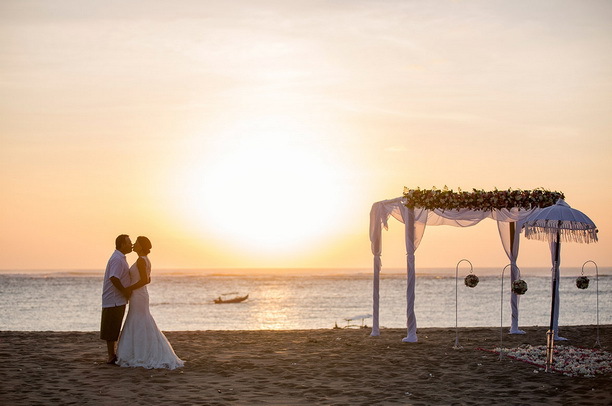 It is one of the world’s best island destinations to tie the knot, with five-star resorts offering dedicated venues to choose from specially designed Balinese cheap wedding packages. Dedicated wedding venues include chapels and customizable outdoor venues with the most stunning backdrops. The weather in Bali is typified by sunny and tropical, allowing great outdoor options, such as the seaside or a forested setting. The most important thing to start off this unforgettable journey is by deciding “When” to have the wedding. 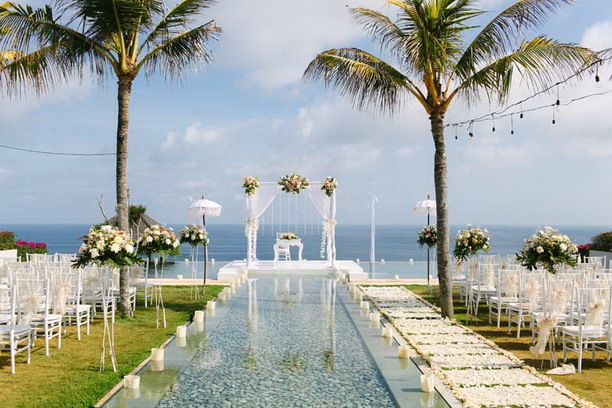 Generally speaking, the best time for a wedding in Bali is between April and October. During that period of time, the weather on the island is way much better than during the monsoon season. Not just that. The wedding venues and airfare tickets are usually cheaper, making it perfect to set the lower budget for you in planning a cheap wedding package in Bali. Based on the airfare, draw out your guest list and stick to it religiously. If you are looking for how to plan cheap Bali weddings, choose from the various packages that the resorts or hotels have on offer. Commonly called as “Wedding in a Box”, they include fun and beautiful wedding packages. When it comes to a venue, you will have loads of options to choose from. Prices vary from venue to venue, based on inclusions. Wedding package prices range from around $500 to $6,000. The prices are final and have no hidden cost. The packages also include everything you need to have on for your wedding ceremony. When deciding on whether to have a villa, hotel, resort or beach wedding, keep your budget in mind. While each of these venue options is going to make a very memorable wedding day, they vary quite significantly priced. Beach weddings are generally cheaper than hotel or resort weddings, while villa weddings prove to be the most expensive option. Also, choose the package catering to your budget. Wedding cakes are priced from $180 including delivery. Food and beverage prices vary between venues, but a one-hour canape service will cost from $15++ per guest and a three-course set menu will cost from $50++ per guest. Bar tab arrangements can also be arranged. The cost of most things is quite reasonable. However, alcohol is quite expensive. “Bring Your Own Bottle” is a very sage advice for all wedding guests in Bali. The entertainment will include local DJs, live bands, and traditional Balinese dancers, but of course, it is depending on your package. This includes all equipment and sound system. When it comes to decorations, it is important to bear in mind that Bali – while being hot all year round – doesn’t’ have a huge range of flowers to choose from your flower arrangements. For this reason, you need to be sure to get on this as soon as you have booked your wedding date to ensure that you end up with something you love at an affordable rate. Alternatively, you can simply go with the decorations offered in your package. Many wedding packages will include a bridal bouquet and matching boutonniere, so need to worry. Looking divinely beautiful is a crucial factor during weddings. The Balinese cheap wedding packages provide services which are highly convenient as they always come to the client’s hotel or villa for both trials and on-the-day Balinese makeup & hair services. Be rest assured to look like a drop-dead gorgeous bride. Professional hair & make-up for the bride and bridesmaids will cost around $190 per person with no touch-up. In doing bali cheap wedding packages, choosing the right Bali wedding photographer can be a daunting task because there are too many options. Since you are planning a cheap Bali wedding, it is best advised to stick to the photographers who come with the package. Depending on the duration of the photo package and whether a local or expat photographer is used, the prices may vary. These photographers are a friendly bunch of people who are creative and will let you enjoy your day with full freedom while they click away photographs and video record your most memorable moments in life. In a nutshell, these packages include venue hire-fee (in-house guests), ceremony venue decorations, seating with covers and sashes, a full legal Protestant wedding ceremony (excluding the cost of the CNI + photos), reception venue set-up, a sit-down reception dinner (excluding beverages), the presence of one of the experienced Event Coordinators to manage the event, wedding planning and coordination services, legalities and document processing services. These services are enabling you to plan a cheap Bali wedding. So, how to plan a cheap wedding in Bali? You know the answer now. Therefore, look no further for destination weddings. 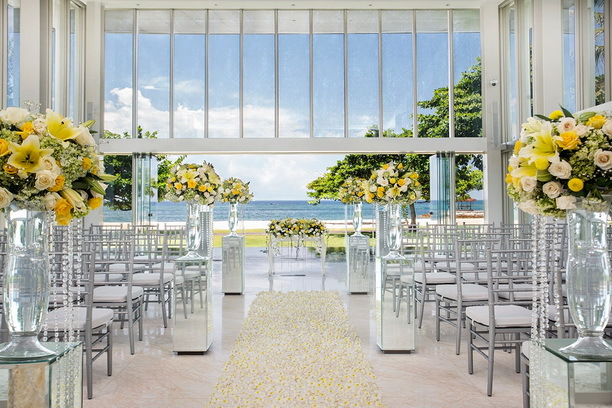 Make your wedding celebration truly enchanted in the tropical island of Bali. Wedding in Bali is truly what dreams are made of. This is the reason why couples are flocking to this island to cement their love and begin their lives together as they mean to go on, filled with happiness and romance. These cheap Bali wedding packages focus on making the whole experience of planning and preparing for your wedding ceremony in Bali as easy and enjoyable as possible. It is super easy to browse through the various wedding packages available where you can match your dream day to your budget and get everything you want quickly and easily. Therefore, embark on your married life in “The Island of Gods”, and make this special day magical!